V339 Del has been in outburst for slightly more than 100 days. The last month or so has been pretty bland. What lies ahead? First, the light curve isn't totally bland. If you look at the attached curve, which covers the last 50 days, you can see the leveling out that happened around October 20 in B and V. As mentioned in Munari et al. (ATEL 5533), this is the time when the ejecta became optically thin and we started entering the "nebular" stage of novae, where emission lines dominate. At the same time, Osborne et al. (ATEL 5505) announced that the nova had become a supersoft Xray emitter, as we started seeing the contributions from the underlying white dwarf. 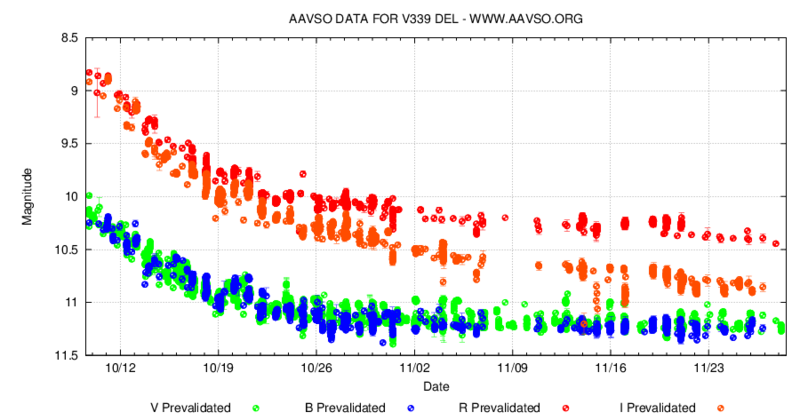 If you look at the Ic curve (orange), you can see that the continuum radiation from the nova is continuing to decrease (Ic has few emission lines in its bandpass). If you assume that the continuum in the V bandpass is also declining, the real nova is probably about 13th magnitude at this time. As the ejecta continue to thin, we'll probably see a slow decline in brightness until the underlying continuum becomes an important contributor to the flux. However, it is not uncommon for dust to form in the 100-day range for novae, and so we might also see a sudden drop in brightness. The best approach is to continue monitoring the nova. If you want to do time series, I'd recommend Ic, where you are seeing the white dwarf; the emission lines are unlikely to show much temporal variation. Daily monitoring is also a very good choice, but try to observe in more than one filter and try to submit average/standard deviation of ~5 individual measures per night, rather than the raw individual measures. Good luck! We can't follow this one much longer, but those who are willing to push your system and observe it to the last conjunction moment will contribute some really valuable data. Looking at the lightcurve, it seems V339 Del fits in with class P in the taxonomy of nova lightcurves analyzed in Strope, Schaefer & Henden. This subgroup has plateaus lasting between 15 and 500 days in the sample of 93 novae studied. The report also notes that 21 % of novae belong to this class, and that, if I understand it correctly, recurrent novae are overrepresented in that category.